In honor of the Royal Wedding, allow me to introduce Fleur. 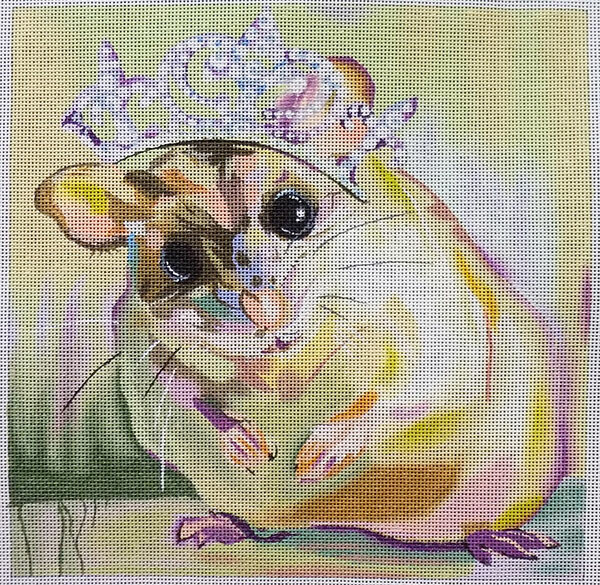 She is a fun loving hamster decked out in her finest tiara. She makes me smile! Interpreted from the art of Kimberly Santini, this charmer will be our Summer Mystery Class. Yes, it is time to think summer! We will stitch this sweet girl in two short lessons July 8 and August 5th from 1-3 pm at the Beehive of Bedecked and Beadazzled. With each lesson a new part of the mystery is revealed. We would love you to join us, but if you can’t, we’re happy to send a kit your way. « Previous: OOOH! Amy Katz is Here! I would like to purchase a kit of “Fleur” . Could you please send me the price and method of payment you prefer. Sweet I see some rhinestones in that tiara!